Well, I guess I can’t just say we have a craving to do “something.” We usually have a craving to do something hurtful or just plain stupid. It makes complete sense in the moment. Yet, rarely do we crave … oh, I don’t know … meditation. Or a nice walk. Or simply not engaging or reacting. We’re leaning more toward yelling, throwing, crying, calling names or making sweeping life decisions. Like, moving to the Virgin Islands. In my parenting, I have found myself in situations where a child is doing everything in their power to engage me. Sometimes I have tried everything in my playbook (muddling through Dan Hughes’ PACE: playful, accepting, curious and empathic) and yet they still spiral into a cycle of yelling, raging or non-stop questions with everyone stuck in a space and held hostage. It feels impossible to survive. Your blood boils. Sometimes you are not able to leave because of others in the house. Here is how I wait: I look at the clock and say to myself, “I can survive this for 15 minutes without doing anything. I can get on my laptop or grab a deck of cards for solitaire or something. But I can just not engage for 15 minutes.” Here is where some of you are rolling your eyes at 15 minutes. Trust me, I understand. I know that rages and shouting matches and arguing can go on for hours, especially with certain types of mental illnesses. But I can’t think that far ahead when I’m writhing in my own frustration and anger. I have to take it in small chunks. I make up games in my head (if they are screaming the same sentences over and over, I mentally add “in bed” to the end of them). I take pictures with my phone and play with my editing apps. I message friends to catch up. I can’t write for pleasure when I’m in that state, so I just focus on being busy. Ohhh, wait. Almost forgot the most important part. You then do the 15 minute thing all over again. And if necessary, again. Then again. And … yup … again. I’m saying this because no matter how many times I write honestly, no matter how many times I admit my own humanness, there is always someone who thinks this is somehow easy for me. It’s not. I hate it. I’ve never liked it. I like helping other parents because I hate it so much and I know painful it is to do it alone. I laugh and I joke to keep from crying so much. I try to help others do the same. 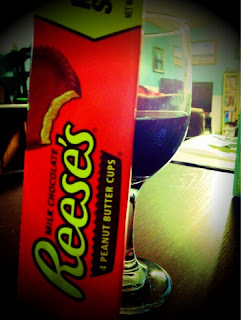 I’m also having wine and Reese’s peanut butter cups for dinner. King size.